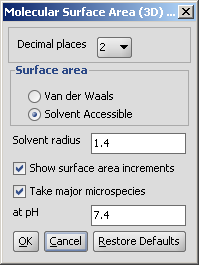 There are two types of available molecular surface area calculations, van der Waals (vdW) and solvent accessible (SA). The calculation method is based on Ferrara et al. 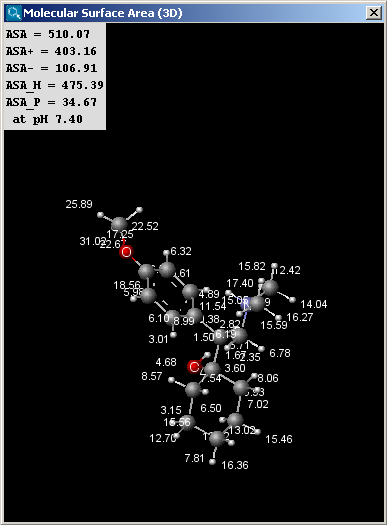 The result window contains the area and the molecule in 3D view. The left window shows the vdW surface, while the right one the SASA. Decimal places: sets the number of decimal places for the result values. Van der Waals: calculates the van der Waals surface of the molecule (in Å2). 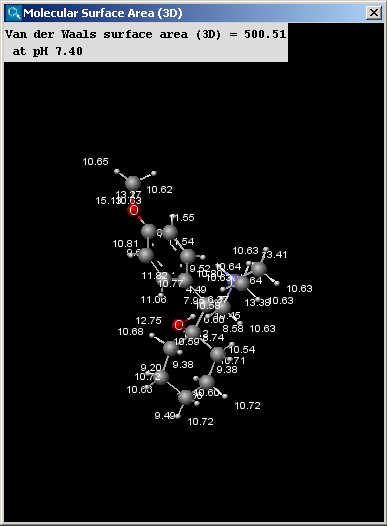 Solvent Accessible: calculates the solvent accessible surface of the molecule (in Å2). Solvent radius: sets the radius of the solvent molecule (by default water, 1.4 Å). Show surface area increments: if set, atomic increments are shown. Take major microspecies at pH: the surface area of the major microspecies present at the given pH is calculated.